Raid Battles are a unique new gameplay element introduced in Version 1.4 which have a co-operative slant in the game. 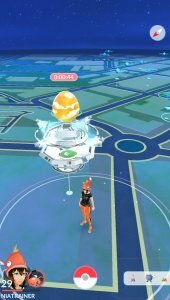 Here, from time to time, a Gym will evict all the Pokémon within it and replace the Pokémon with a giant egg with a countdown, allowing you to get to there when a Raid is about to happen. When the countdown hits zero, a giant Pokémon will appear at the top of the Gym and a Raid Battle can commence. It lasts for 45 minutes. Raid Battles require a Raid Pass or a Premium Raid Pass to access them. 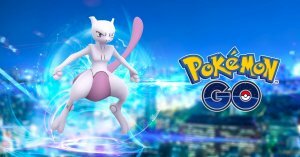 You can get 1 Raid Pass a day through a Gym, or purchase a Premium Raid Pass for multiple uses in a day. You can only hold one pass at a time. You can have both public and private raids, with each Raid Battle having a difficulty level suggesting the amount of people that are recommended. You can have up to 20 people battle in a raid at once, and everyone works together regardless of teams. Private rooms are locked using passwords based on Pokémon. 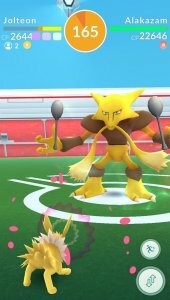 Like with standard Gym Battles, you can bring in six Pokémon into the Raid Battle. This means, with the maximum of 20 players, there can be 120 different Pokémon used against the opponent. 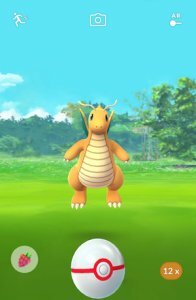 The opponent is larger than normal and has significantly higher CP, usually in the high 10,000s or 20,000s. The battle system is exactly the same as in normal gyms with tapping being Fast Attacks, holding down being Charged Attacks and being able to swipe left and right to dodge. The more important aspect, however, is the ability to capture the Pokémon that you battled in the Raid. This Pokémon will have higher CP and stats, at Level 20 in Normal Weather or 25 when weather boosted, but it can only be captured using Premier Balls obtained in the Raid. Once you are out of Premier Balls, then the Pokémon will flee, but you can use berries to make them easier to capture. EX Raid Battles are a special invitation Raid Battle. On occassion, an EX Raid Battle will be assigned to a Pokémon Gym and everyone who participated in a Raid Battle at the Gym in recent times will receive an invite and a special EX Raid Pass. This allows for them to participate in the EX Raid Battle during the allotted time. Due to them being invite only, they are quite rare and there's no way to determine where one will drop ahead of time.